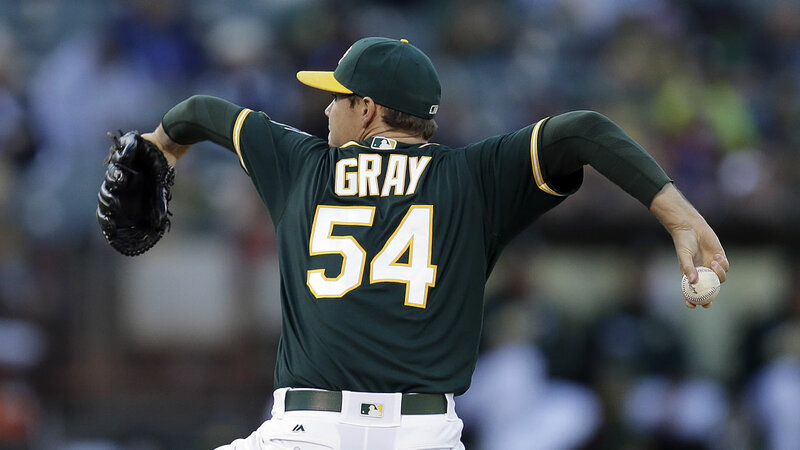 OAKLAND, Calif. -- Colby Lewis lost his no-hit bid for Texas in the ninth inning when Max Muncy opened with a double that glanced off right fielder Nomar Mazara's glove Thursday in the Rangers' 5-1 victory over the Oakland Athletics. Muncy led off the ninth with a drive to deep right field. Mazara, a rookie who made a nice running catch to rob Muncy in the third, ran hard as he angled back to the corner. Mazara tracked down this ball but couldn't hold onto it as he crashed into the padded wall. Mazara looked at his glove as he retrieved the ball. Official scorer David Feldman immediately called the play a double, ending Lewis' quest for Texas' first no-hitter in 22 years. Two batters later, Lewis (6-0) lost his shutout when left fielder Ryan Rua couldn't make a diving catch on a blooper by Coco Crisp that went for an RBI double. Last September, the 36-year-old Lewis also took a perfect game into the eighth against the A's. Danny Valencia broke that up with a leadoff double. Lewis was aiming for Texas' first no-hitter since Kenny Rogers threw a perfect game in 1994 and the second in the majors this season after Jake Arrieta did it for the Chicago Cubs against Cincinnati on April 21. The A's haven't been no-hit since four Baltimore pitchers combined to do it in 1991. That's the longest stretch any big league team has gone without being held hitless. Lewis was barely threatened the first eight innings as he got the A's to swing early in counts and only got to three balls three times in the first seven innings. He needed just 16 pitches through the fifth and sixth innings, retiring Muncy on a bunt attempt in the sixth. His bid for perfection ended in the eighth when he walked Alonso on four straight pitches with two outs in the eighth. Rua then made a jumping catch on the warning track to get Lewis out of that inning. Lewis flirted with a no-hitter late last season at home against the A's, finishing with one of his three career two-hitters. Daniel Mengden (0-2) allowed two runs - one earned and four hits in 6 1-3 innings of his second career start. Mengden had retired 15 straight batters before Ian Desmond homered to right leading off the seventh to give Lewis a 1-0 lead. The Rangers added another run that inning and then broke it open with three in the eighth, including Adrian Beltre's two-run double off Fernando Rodriguez.